CHINA IS THE third most vulnerable country to river flooding after India and Bangladesh, with some 3.3 million people at risk, according to data recently published by the World Resources Institute (WRI). It would rank first in terms of absolute GDP at risk, at $18.1 billion a year, though that accounts for a relatively tiny percentage of the country’s entire economic activity. The rainy season has brought floods since time immemorial. However, in common with other developing nations, China has rising amounts of economic activity exposed to flood risk. More people, buildings, and infrastructure get crammed into vulnerable regions as the country becomes richer and more urbanized. Floods become larger and more frequent because of climate change. The WRI reckons that by 2030, the $18.1 billion of GDP at risk annually will have risen to $94.6 billion. Economic development accounts for $61.6 billion of the increase; climate change for $14.8 billion. Floods in cities are both more difficult and costly to manage than those in the countryside. Sewers and storm drains are often old and inadequate, run-offs from hard surfaces absent, and ground storage for rainwater scarce. New building covers ever more floodplain. Ancient streams that could absorb overspill from swelling rivers and channel rainwater back to rivers and ponds get filled in. Redressing these problems are huge engineering tasks that cities cannot complete overnight. Beyond that are longer-term policy imperatives: building greener cities that are less encouraging to extreme weather, and not allowing development in flood-prone areas in the first place. The numbers quoted here come from WRI’s interactive map of flood risk, the Aqueduct Global Flood Analyser (GFA). They assume China has flood defenses adequate to cope with the severity of flooding experienced every ten years. Changing the assumption to 5-year-flood protection levels turns $27.9 billion a year of urban damage into $139.6 billion over the same period. Change it again to 100-year-flood protection, and current annual urban damage falls to $3.1 billion and the 2030 figure to $18.8 billion. As that range of numbers suggests, the data is intended to provide policymakers with a guide to the cost-benefit of different levels of flood protection. The GFA looks in more detail at six flood prone river basins in China and two coastal plains that are additionally exposed to rising sea levels. From 2011 to 2020, China’s investment in water conservancy projects, which includes flood defenses, is expected to reach 4 trillion yuan ($617 billion). That would be almost four times as much as spent during the previous ten years. Nature provides lakes, ponds, streams and floodplains to do much the same job. They cannot be sacrificed infinitely in the name of economic development if China is to deal with flooding and its opposite natural disaster, drought. Urban planners are only just starting understand this. This latest WRI data underscores the urgency of the need to protect, restore and reconnect lakes, ponds, streams and floodplains so they can do what they do best. China last year was spared the large-scale population dislocations caused by natural disasters that it experienced in 2010. That year monsoon flooding, earthquakes and the like uprooted 15.2 million people from their homes. Yet the figure for 2011 was still 4.5 million, more than for any other country. And natural disasters also left 1,126 people dead or missing last year, we should not forget. It all again underlines the human cost to the vulnerability of the country to natural disasters, and why so much effort and money is being put into monitoring them, preventing them and minimizing their effects. The numbers are collated by the International Displacement Monitoring Centre of the Norwegian Refugee Council. The Centre has been keeping track for the past four years of the effects of extreme weather and geophysical hazards such as earthquakes and volcanoes. It has just presented its most recent report to the Rio+20 environmental conference. Such is the size of China that the change in its figures between 2010 and 2011 accounts for two-fifths of decline in the worldwide number for natural-disaster dislocations from 42.3 million to 14.9 million over the same period. Asia as a whole and China in particular is the most effected region (see table below). The biggest single displacement in 2011 was of 3.5 million people, caused by monsoon flooding in southern China. Overall, three in a thousand Chinese were displaced by natural disasters last year, which compares with three in a hundred in Sri Lanka, the country with the highest proportion of overall population displaced in 2011. China’s raw and relative numbers for the country would have been higher had the report included what it calls “slower-onset or gradual processes of environmental degradation such as drought and desertification”. The International Red Cross has published a map of the provinces most affected by the flooding caused by the torrential summer rains this month that broke the drought in central and southern China. Just about every one along the middle and lower reaches of the Yangtze river has been hit by what are being said to be the worst floods since the 1950s. The thumbnail above clicks through to a .pdf version of the full sized map. 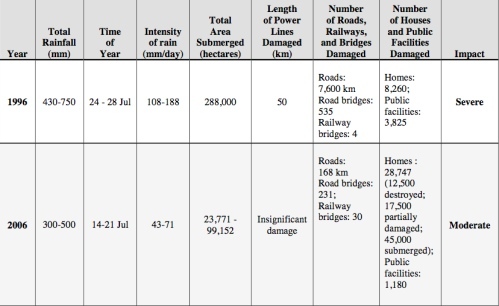 The flooding in North Korea last year, which came in parallel with the devastating floods across much of China and was described at the time by North Korean state media as “severe”, had only a minor impact on North Korea’s crops and infrastructure. That is the conclusion of a report from the U.S. Central Intelligence Agency’s Open Source Works, which mines publicly available information to produce unclassified reports. More unusual weather is in the forecast for the final three months of what has already been a highly untypical year of drought and floods, according to the latest seasonal forecast from the International Research Institute for Climate and Society, the source of the U.N. Office for the Coordination of Humanitarian Affairs (OCHA) regional weather outlook maps (snapshot of the latest below; full map). As northern China heads into its dry season, there is likely to be heavier than usual rains in central China between October and December (the darker green area on the map, left). However, in the south, barely over the summer’s floods, dryer than usual weather is in the forecast for the same period (the orange areas). Temperatures are likely to unseasonably warm across the country, and especially in the southwest, though that stands in contrast to the prediction in August by Jiao Meiyan, deputy chief of China Meteorological Administration, that winter will be severely cold. Meanwhile, rain has returned to Hainan, the most recent province to have been inundated by flooding, disrupting the lives of 2.7 million people across the island. The flooding on Hainan following the heaviest rains on the island in 40 years has turned deadly. Authorities say one fisherman has lost his life and three others are missing, with more than 210,000 people now evacuated from 1,160 inundated villages. An extensive rescue operation is underway. Flood damage, including to the fishing fleet, is extensive. Meanwhile, efforts continue to deal with the threat of a potential dam collapse in the provincial capital Haikou. And as we have written so many times this year, more rain is in the forecast. A last hurrah for the rains and floods that have devastated so much of China this year? Some 65,000 people have been evacuated from their homes on Hainan as floods inundated more than 500 villages on the island that is the country’s southernmost province. At least two people are reported missing. Communications have been cut to some parts of the island with at least one highway reported impassable because of the floods and ferry services to the island disrupted. Rescue operations to reach 6,000 people stranded by the floodwaters are underway. The direct damage to farmland is put at a relatively modest 18 million yuan ($2.7 million) with 2,260 hectares of crops destroyed and a further 7,420 hectares damaged, according to provincial officials. but the total economic damage is likely to be at least twice that. Hainan is a tourist destination. The picture, above, shows surfers off the beach at the resort town of Sanya earlier this year, when water was enjoyable. This is now peak travel season around the National Day holidays. Visitor numbers are down by a half this year.